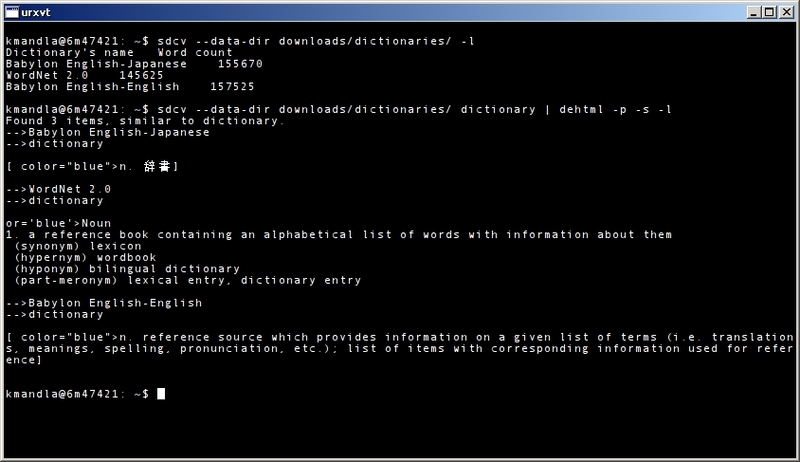 I’m a big fan of dict, the online dictionary and thesaurus tool that runs almost completely at the command prompt. 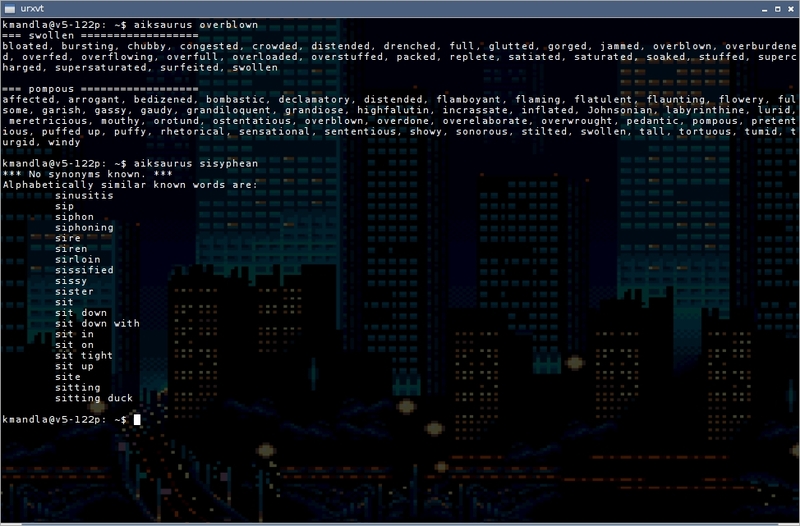 sdcv is a console interface to the somewhat-dated StarDict tool. 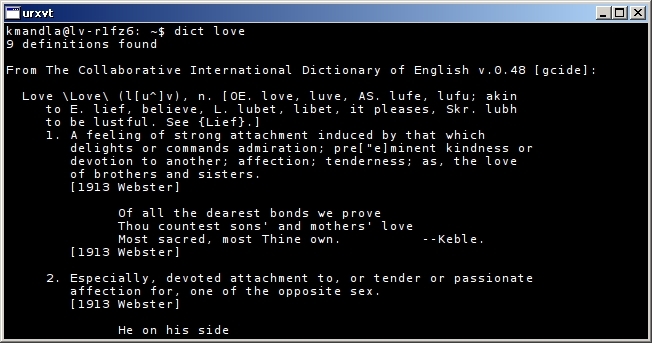 And in contrast to dict, sdcv works with locally downloaded (or created, I suppose) dictionaries. There’s not a whole lot to see with sdcv, although that will depend entirely on how many dictionaries you have, and what you ask of them. Output is a little odd. I think that might be because the dictionaries are intended for a graphical tool, not strict text. I don’t see any options within sdcv to strip out that coding, so I’m going to enlist the services of dehtml … and that’s what you see above. It’s not perfect, but it’s more readable than as it appears raw. Of course, the alternative to that is to pipe sdcv’s output into a file, and use a browser to open it. Either way, there may be some added steps to viewing a definition. On the other hand, you do have the pick of several dictionaries, cross-language or otherwise, and they’re stored locally. And being the clever young hacker that you are, I’m sure you’ll find a way to build your own dictionaries too. So to recap … dict for online dictionary access in clean plain text, or sdcv for custom dictionaries stored locally and subject to your scrutiny. You can choose which you like. Or … why not both? This entry was posted in Linux and tagged dictionary, gazetteer, reference, thesaurus, translation on 2014/04/20 by K.Mandla. I mentioned a long while ago that the biggest help in writing for this crummy blog is charm, and a capable lieutenant to charm was aspell. I neglected to mention dict, and that was a grievous oversight. 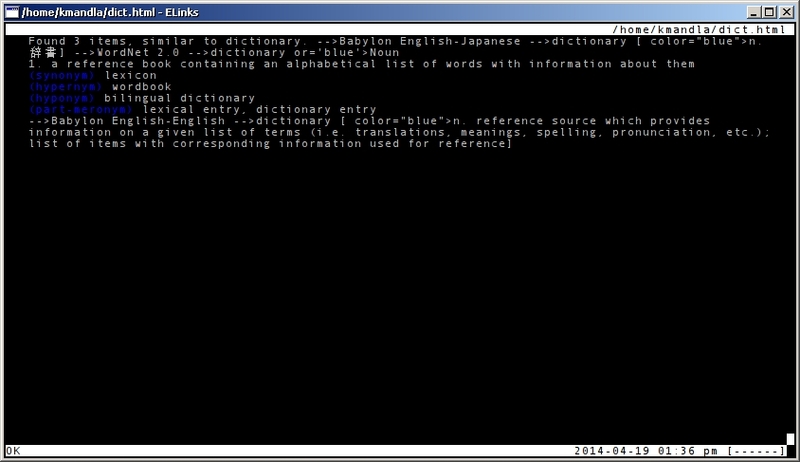 dict is a huge timesaver, even if you don’t live at the console 100 percent of the time. On the other hand, dict can skim through a rasher of dictionaries, gazetteers and thesauri in a fraction of a second, and come up with answers that are just as good. And in this age of impatience — oops, I mean information, speed is king. Best of all, there is a laundry list of translation dictionaries, gimmick dictionaries, jargon lists and so forth to install. Have fun with Ambrose Bierce’s classic Devil’s Dictionary, for starters. I don’t like saying this too loud, because once word gets out, everyone will want it, but: If you don’t have dict on your machine, you’re missing out. This entry was posted in Linux and tagged dictionary, gazetteer, reference, thesaurus, translation on 2013/10/12 by K.Mandla. This being August means roughly three-quarters of the year is over. When I debated this little adventure, way back in December of 2012, I thought to myself that I could probably come up with enough applications to fill a post a day for a year. At the time I had a list of about 400 programs — some useful, some not, some only borderline interesting — and I figured with what I would naturally cull for lack of interest or lack of information, one a day was acceptable. After that I thought I would quit again, or leave the remainder to the public to investigate on their own. Well, like I said, this is August — and in terms of Julian days, we’re rolling into the 220s and even 230s. And truth be told, I still have a lot of applications left. A lot more. And that seems to be the case most of the time. For every program I mention, two more flutter up from the depths. And for every new one, I find another I hadn’t heard of. So let’s do this systematically. Let’s start in the A’s this time, and I’ll work through the software I know about and can install and have source code for that don’t require esoteric networking arrangements or armies of blackhat crackers to fend off. Let’s go with something simple. Here’s aiksaurus, as innocent and helpful as you could ever want from a console thesaurus. This entry was posted in Linux and tagged thesaurus on 2013/08/18 by K.Mandla.